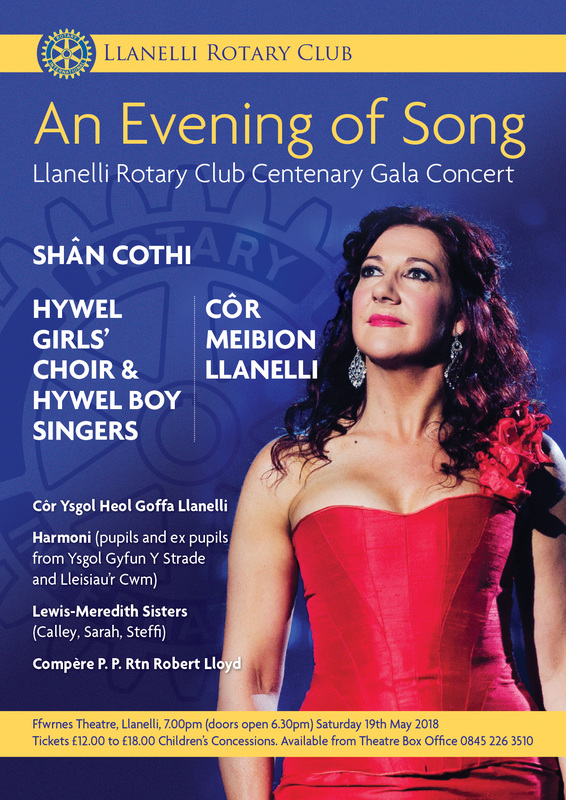 Shân Cothi, one of Wales’ most popular sopranos, will be sharing the stage with two of Wales’ international choral ambassadors Côr Meibion Llanelli (musical director D. Eifion Thomas) and the Hywel Girls’ Choir and Hywel Boy Singers (musical director John Hywel Williams MBE). Joining them will be the delightful sounds of Côr Ysgol Heol Goffa (musical director Bridget Radford) ‘Harmoni’ an ensemble comprising pupils and ex-pupils from Ysgol Y Strade and Côr Lleisiau’r Cwm (musical director Catrin Hughes), and the Lewis- Meredith Sisters – Calley, Sarah and Steffi. Compe’re will be Rotarian Past President Robert Lloyd. Come and join us for what promises to be an unforgettable evening.